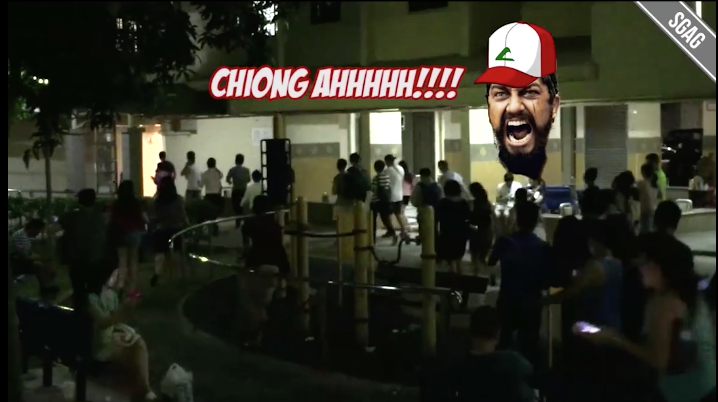 Just last night, local digital content platform/our daily source of entertainment SGAG released a video which saw them pranking Pokemon GO players at the legendary Block 401 on Hougang Avenue 10, which is famed for rare catches. 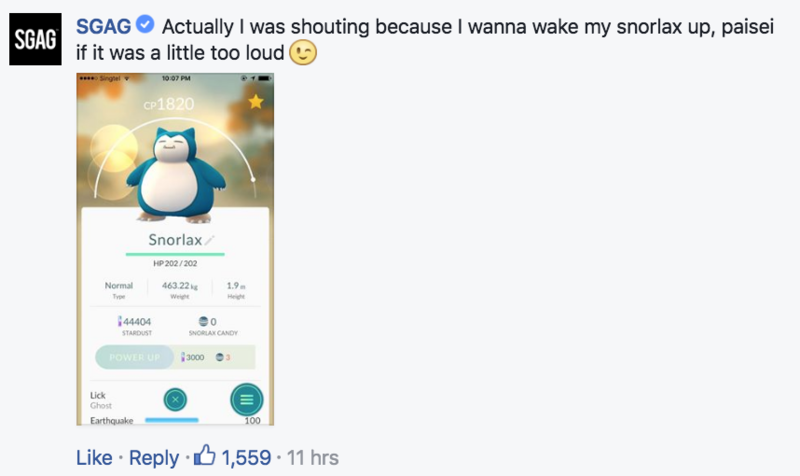 The prank basically set itself up – “Xiao Ming”, one of their most well-known characters, yelled “Snorlax!” (a rare, powerful Pokemon) while hiding in a corner. As expected, chaos ensued, with players demonstrating unrehearsed unity that only Pokemon GO can inspire, and they made a dash towards the similar direction – not second-guessing for a moment the legitimacy of the claim. 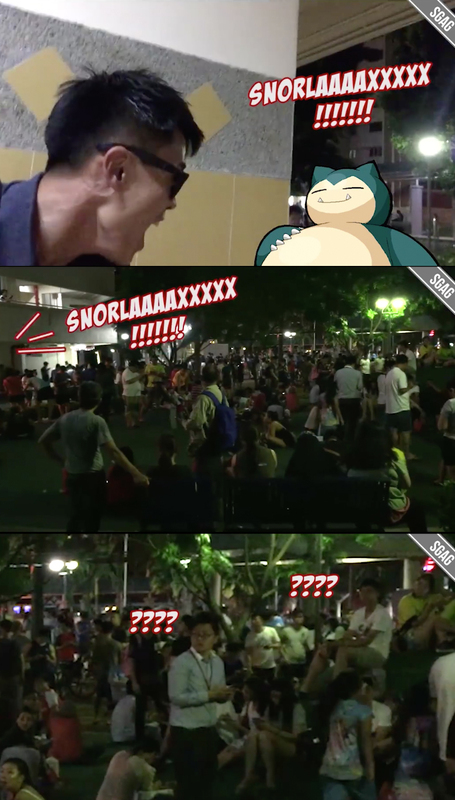 As the crowds moved towards the direction of the commotion, we see them standing around, eyes glued to their phones in hopes of spotting the Snorlax, while Xiao Ming chuckles to the camera just before the video ends. While we’re not sure about their reactions, I’m guessing they simply went back disappointed, since there’s no concrete way to predict how long a Pokemon will appear in an area. I was immediately reminded of my childhood, when many coffeeshop lunches were punctuated with a random kind soul (usually the owner of the coffeeshop) yelling “SUMMON AUNTIE!”, and almost immediately, hoards of adults (my parents included) would be seen rushing towards the carpark. I didn’t know what that mean then, but later on, I found out that it was so that they could quickly drive their cars away or place a parking coupon so they won’t get a fine from the parking warden (aka Summon Auntie). 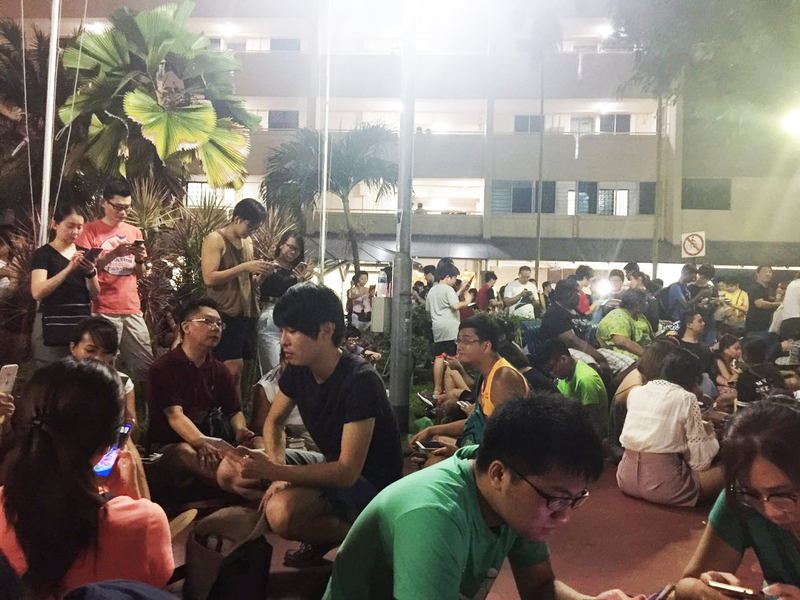 While these wardens are now being replaced by mechanised parking systems, it seems like the spirit of looking out for each other among Singaporeans is still strong – especially with the advent of Pokemon GO. While SGAG’s video isn’t the greatest example of it (since it’s a prank after all), I had first-hand experience at the very same venue. Just two weeks ago, I decided to check out the famed spot at around 10pm since my place was just a 20 minute walk away, and managed to drag along a fellow player (and victim of my curiousity) – my boyfriend. Even before we got to the open area where players usually gather, the roadside was already flooded with people standing around staring at their phones. All I can say is – the hype over how crowded the place is DID NOT disappoint. We quickly found a place to settle down among the crowd, and with our apps open, were partly “observing people – it’s for work, okay”, but mostly “wanting to be the very best”. One hour in, and the most exciting appearance was a Dragonair – which (I’m still annoyed at this) ran away when I tried to catch it. When it appeared though, loud whispers of its name echoed through the mob, and there was a surge of excitement amongst the mostly subdued crowd. However, other than that instance, everyone mostly kept hushed conversations within their little groups – save for the enterprising soul who was selling chilled water at 50 cents a bottle. A while later, a group of bubbly young girls sat next to us, and my introverted self was quickly drained by their chatter, so we planned to leave in “5 minutes time…if we don’t catch anything”. My age also means that bed time is usually before midnight. 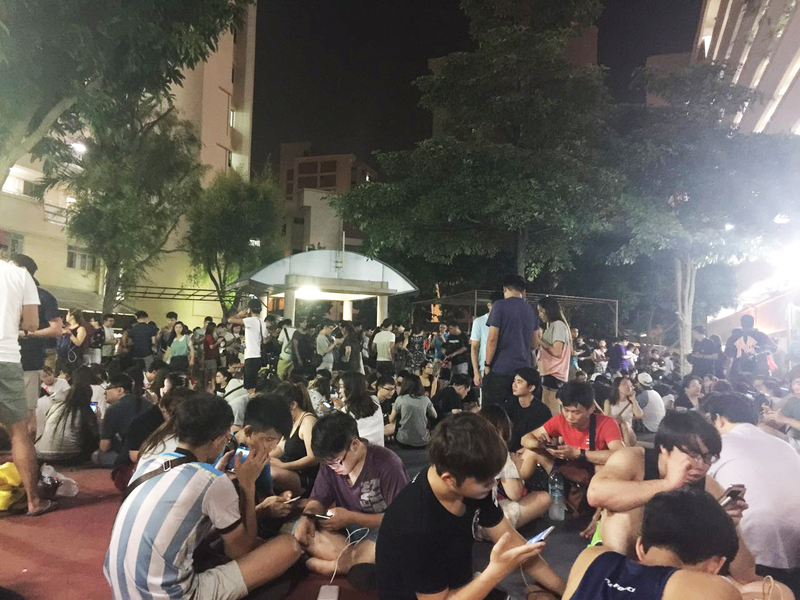 However, just as we were about to stand up and leave, I noticed that a bunch of players were running towards Hougang Park just across the road – which was another hotspot for rare catches. Me: Oh my god, let’s follow them. BF: What are we running for? Me: Don’t know, just follow! Soon, we were in the thick of the action – but still not knowing what in the world we were running for. And it seems like we weren’t the only ones, as I heard the question “What are we finding ah?” being thrown around. Someone next to us said that it was a Dragonite, but even he himself looked lost. We soon got to the main road where many were dashing across with little regard for traffic. The road was relatively quiet, but there were more than a few close shaves which happened in that 1 minute. I’m quite a coward, and before we could wait for a time that the road was clear, a police officer appeared and yelled at all of us to “Use the traffic light it’s just down the road!”. After reaching the park, we realised that those who arrived at the same time as us were also lost on which rare Pokemon they ran all the way for. Perhaps we were too late, but up till this day, I’m not even sure if we were also part of some cruel prank. For the experience – definitely. For the possibility of catching a Pokemon – maybe not. 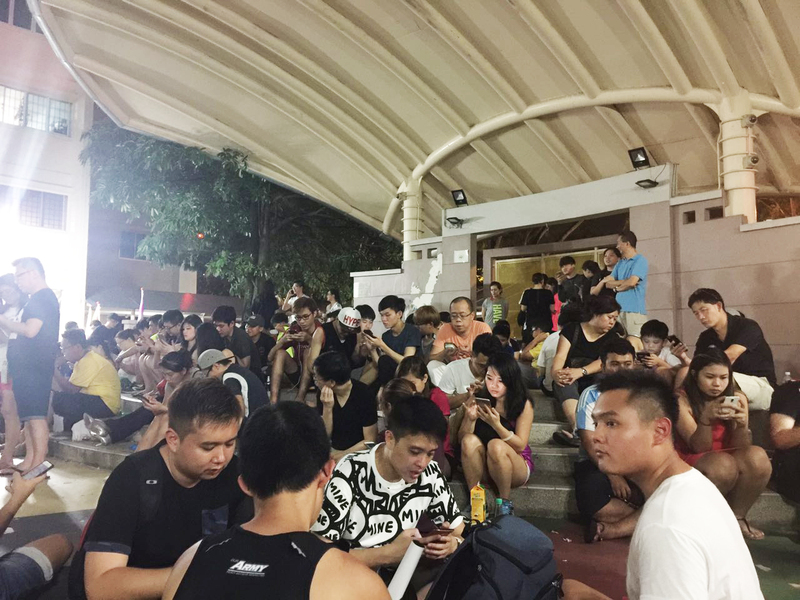 Regardless, I do think that Pokemon GO has united Singaporeans on a scale nothing else could have. We have Pokemon GO-related groups and pages on which Singaporeans share tips and hotspots, and we even have those who volunteer to clean up the areas that other players have left dirty and messy. The prank video, though, unwittingly became a social experiment, and is also concrete evidence that us Singaporeans can be so damn kiasu that we neglect all logic just so that we won’t lose out. Lose out on what? It doesn’t matter – just run first.